We are pleased to announce timely release of The Perfect Tree for Linux. 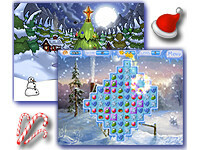 The Perfect Tree is Christmas themed match-3 game, with cheerful music, joyful game play and the best atmosphere for upcoming holidays. This entry was posted in Anawiki Games, Games. Bookmark the permalink.